Dr. Poehlmann & Co., based in Herdecke, Germany, offers OTC drugs, tonics and food supplements. These products have all been developed and produced according to the quality standards required for pharmaceutical products. Products with beneficial health effects are becoming more and more important alongside curative treatments. Patients are requesting herbal remedies, e.g. our ginseng energy booster. The products of Dr. Poehlmann & Co. are well known, thanks to their high quality. Dr. Poehlmann & Co. supplies pharmacies as well as drugstores. The most well-known brands from Dr. Poehlmann & Co. are Tai Ginseng, Voltax and Solaguttae. They are all medicinal products or nutritional supplements, made from natural substances and thus meet the demands of an ever-growing target group. The active ingredients in the products of Dr. Poehlmann & Co. are Ginseng, Hawthorn, Thyme, Valerian and Hops, the B and E Vitamins, Phospholipids from Soy Lecithin and Pepsin. 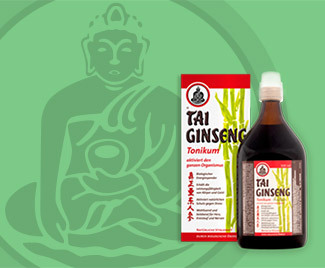 Tai Ginseng also contains vitamins of the B complex as well as Hawthorn. Hawthorn has been used for a long time in European herbal medicine. The balanced combination of high quality, pharmaceutical grade ingredients – Ginseng, Hawthorn and Vitamin-B complex – makes Tai Ginseng a truly unique product in the market.